Ten months ago Senator John McCain (see pic) was invited to the British Conservative Party conference as the star attraction. 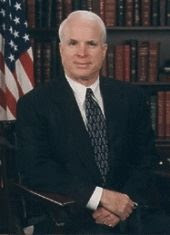 At the time he was the Republican Party’s front-runner to be their Presidential candidate for the 2008 election – which he had been for some years. But, his campaign seems to have taken a possibly fatal stumble as today the New York Times is reporting that he may be forced to drop out of the race altogether. Our local elections are under three years away and local Conservatives now openly boast that “it’s already in the bag” - relying on the on-going gentrification of the area to deliver them another win. Such an attitude may have led them to believe that it won’t affect the result if they cut police numbers, close community centers, give themselves an 18% salary rise, shut down three local schools, charge for removing garden waste, cut home care or increase meals-on-wheels charges to the elderly and sick by £200.75 a year - which are just some of the controversial measures they've introduced in their first year. We will have to see if they're right. However, power really is with the people at election time and although local government doesn't get the spotlight of the national arena, the public don't like to be taken for granted. Political allegiances can change – as Senator McCain is finding out on the other side of the Atlantic.